Christie 360 Experiential Studios, the digital strategy and content powerhouse for Christie, has joined forces with TCL Chinese Theatre, the most iconic movie palace in the world, to captivate visitors and movie goers with a high-impact multimedia production using the most advanced projection technologies. The transformation from traditional bricks-and-mortar to a digital canvas was achieved through the wonders of ‘projection mapping,’ a technique that uses projected images, blended to fit perfectly onto irregularly-shaped surfaces, to tell stories and ignite action. 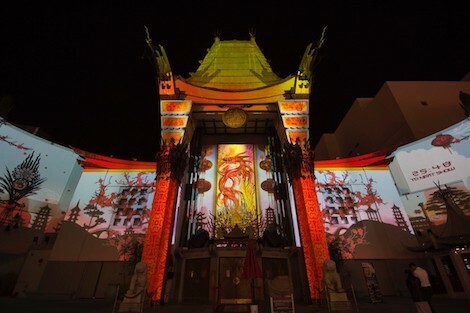 For TCL Chinese Theatre, teaming with multimedia directors and software specialists working for Christie 360, this involved ‘producing’ several colorful, immersive illusions combining traditional Chinese fireworks and mythological creatures with intense, evocative color and black and white clips of famous movie scenes. 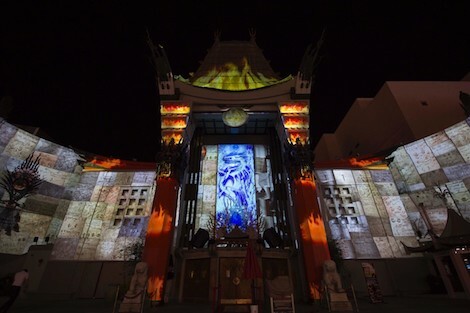 The central motif of the show projected onto the Chinese Theatre façade is a Chinese pagoda enclosing a dragon in relief. Dramatic lighting during the projection mapping show highlights the dragon, and animated elements bring it to life on the adjacent walls. The motif is not just physically central but thematically as well, since its lush Chinese-inspired architectural detailing and interior design, a throwback to the showy extravagance of Tinsel Town’s Golden Age, has contributed to making the Chinese Theatre an enduring Hollywood icon. The flipping, cascading tiles in the midst of the projection mapping show are realistic representations of the actual hand- and footprint tiles in the Chinese Theatre forecourt. Almost a century of stars leaving their marks in the wet cement of the forecourt has gone a long way in making the Chinese Theatre the institution it is. Imparting an illusion of depth to the façade, the rotating, cascading and flipping effects are a proven bit of the visual language of projection mapping. The montage of movie clips near the end of the projection mapping show is TCL’s way of tipping its hat (so to speak) to 100 years of cinema history. It also works as a sort of basic timeline of the Chinese Theatre’s history and that of Hollywood Boulevard itself, which matches in large part the history of big screen storytelling. Moreover, most (if not all) of the clips featured are pulled from films that premiered at the Chinese Theatre. Finally, the Theatre ‘crumbling’ at the end of the show exploits another classic trope in projection mapping visual language. Beyond the illusion of depth that the crumbling delivers, the dramatic ending is meant to give the audience a sense of climax and catharsis. As for the ‘gear’ used to merge and deliver the content, it consists of high-brightness projectors (mainly Christie Boxer 3DLP projectors), processing ‘brains’ (the Christie Pandoras Box media server) that merges all sorts of media and control the show, and intuitive ‘auto alignment’ tools (Christie Twist) to blend the visuals. This entry was posted on Tuesday, May 23rd, 2017 at 16:58 @748 and is filed under DailyDOOH Update. You can follow any responses to this entry through the RSS 2.0 feed. You can leave a response, or trackback from your own site.